When I travel to different countries, I have to 'reset' my mind, body, emotions, habits, and attitude so that I can 'just be present'. Upon arrival, I wasn’t anxious to know what was going to happen the next day. Everyday felt like I was really given ‘just that day’ to live and eat, and wanted to take advantage of every moment. If I didn’t, it would pass by under a blink. At the Lunch Lady, there is no menu. They just serve you basically everything you see here, noodles change daily. Seriously too good! We had a short (but not too short) 6 days in Vietnam. Since it was our very first trip out there, we wanted to absorb what Ho Chi Minh City (Saigon) had to offer, then have a quick stop over in another city. 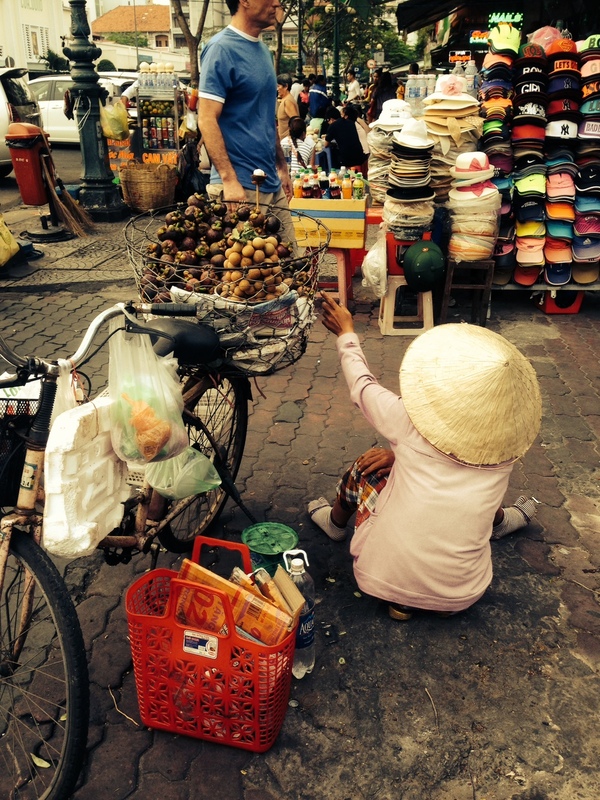 Most of our friends that have traveled to Vietnam, recommended visiting Hoi An and Hanoi. Both beautiful cities of course, but for this visit, we were looking forward to the beaches of Nha Trang towards the tail end of our trip. 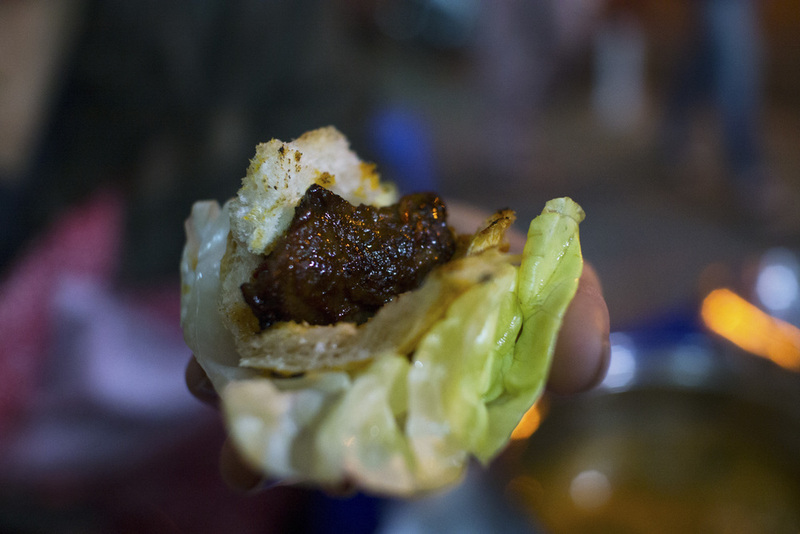 As first timers, we spent a good amount of time running around HCMC, checking off the food list from the foodie residents. It was great. We weren’t sure if we could even check half of the items off the list, but I guess when you’re on a mission with an appetite, anything is possible. I would say 2 full days in HCMC is great. Of course if you stay longer, there is more to see and do. However, if time is limited, you can definitely cover a whole lot in 2 days. Things are relatively close to each other. Walking around town or taking a cab will not take up your whole day either. Although I think it’s easier to take a cab around, since crossing the streets with all the mopeds were bit insane. We got used to this half way through the trip, but each time we had to take a breath before we crossed streets. Banh Mi on the streets in Saigon Centre-just look at the set up! Typical road traffic. Yeah, try crossing one of these and then we'll talk. Chowing down at Banh Mi Huynh Hoa "The Lesbian Banh Mi Place" (26 Le Thi Rieng). To sum up my observation of HCMC-it was a lot cleaner and more developed than expected. People in Vietnam were just downright sweet. The food-oh jeez. Seriously, the food is in its own category. A glorious one, really. Almost everything was so fresh, tasty, healthy, and simple. I’m normally not a huge fan of street foods (bad experiences in Seoul). However, street food in Vietnam is just as good, if not better than the restaurants. You really can’t complain when Banh Mi sandwiches run on average $1 U.S. Pho is on average $2-$3. The coffee? I think I overdid it on the coffee. I was drinking it like I was never going to have coffee again, haha. Why not right? I was on holiday! 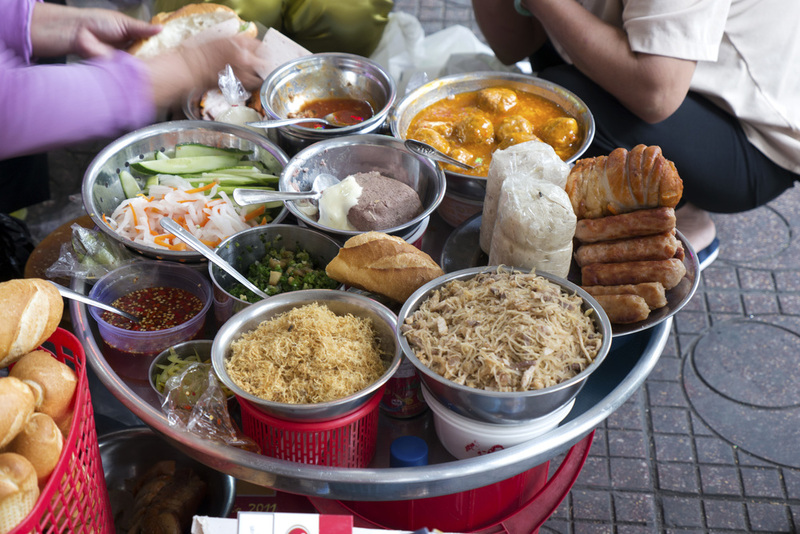 Vietnam is just one of those places where you really have to eat everything in site. No shame in unbuttoning your top pant button. Seriously. Remember these back in the day??? Men trying to get a tree off of their wagon? Ready to adopt one of these kiddies at the Thai Camvien Zoo (Saigon Zoo). Cooking class at the Saigon Culinary Art Center-we learned how to make vegetable salad rolls (a.k.a. spring rolls), Nuac Mam (fish sauce) with braised white fish, rice in claypots, and a sweet and sour soup (can't remember the name). L'Usine Hipster Cafe (151 Đồng Khởi) in Saigon Centre. HCMC had a lot to offer, and we were able to mix in a good number of street eats+nice restaurants+local activities+tourist sites+pampering. Although most of the places we ate were amazing, our absolute favorite was May Cloud (see photos and info below). This was the only place we hit twice. For a nice dining experience with amazing service, the prices were very affordable (our average tab was $25 for 2). It’s nice to mix in restaurants and local fare in Vietnam. So if you’re visiting HCMC anytime soon, May Cloud is a must! 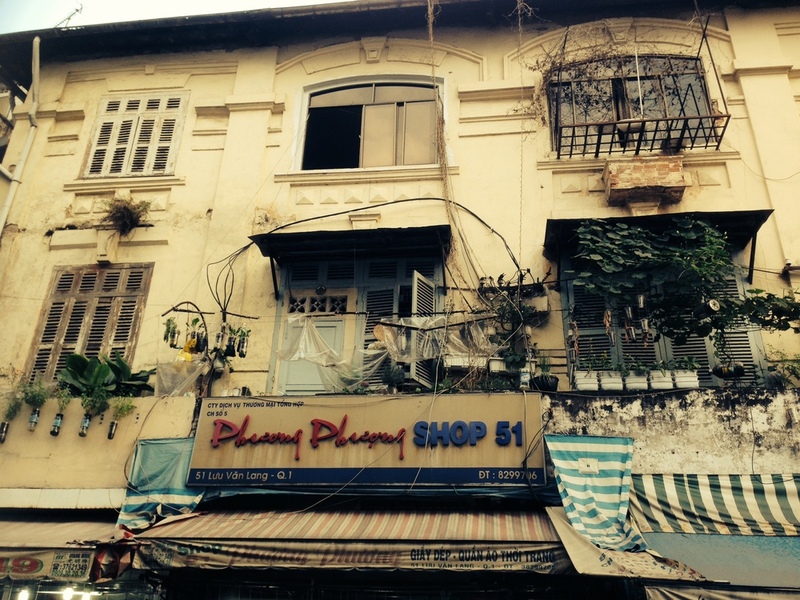 Snapshots of different alleys in Ho Chi Minh City. 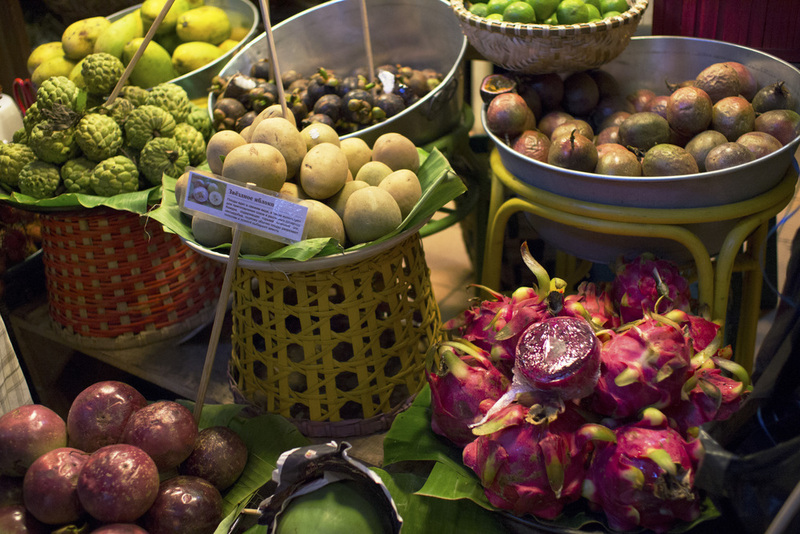 Fruit stand in Nha Trang. Spending the last few days of our trip in Nha Trang along the South Central Coast could not have been a better decision. An hour plane ride from HCMC will take you to the beautiful beach front. We stayed at the Sheraton Nha Trang, in which a girl couldn't ask for anything more (I was sooo not ready to leave!). The cool thing about the week we were in Vietnam, it was during the ‘Tet’ Lunar New Year, which is a huge 3 day celebration there. Everywhere we turned, we saw folks preparing for the holiday, markets were packed, and traffic was nutty. It reminded me of the Chuseok (Thanksgiving) holiday in Korea. Anyhow, we were fortunate to celebrate the eve of ‘Tet’ on the rooftop of our hotel, and saw the count down and fireworks along the beaches. Wow. To see how all of the ‘Tet’ activities unfolded in both HCMC and Nha Trang was truly something else. Good eats at the Sheraton Nha Trang. Don't ask how many Banh Mi's we had for breakfast everyday. One of the best breakfast buffets! Sweet old man writing New Year's blessing on a scroll for us. This was a free service by the Sheraton Nha Trang during the 'Tet' Lunar New Years! May Cloud (3/5 Hoang Sa, Ward Dakao)-the exterior and interior of this space was just beautiful. Papaya salad from May Cloud. Our crazy list-Thanks to Jen Yi from 'Sites and Bites' and Jan Ekholm! Didn't quite make it through all of it, but wanted to share this for those planning a trip out to Vietnam! Almost all of the places below are in Ho Chi Minh City, except for one spot in Nha Trang. * are the must places to check out!